The executives from RIM have talked about how they want to minimize the use of the homescreen, and try and get away the in-and-out pattern of launching apps. To this end the process of invoking another app’s card is brilliantly implemented, and when it makes sense will provide users with a seamless experience. But at times users are going to want to use the homescreen, and when they do they are going to be very disappointed. The homescreen experience on BlackBerry 10 is absolutely terrible. There is practically no way to organize your installed apps. Even though I am only using my DevAlpha for developing and testing apps, I already have more apps than I can manage on the device. If this was the situation on my day to day phone, it would be the kind of annoyance that would lead to me downloading less apps, because I would not want to deal with managing them all. (And as an app developer, I clearly want people to download more and more applications). What is worse, is that most of the limitations seem to be rather artificial. You can not have nested folders, you can’t have more than 16 apps on each page, you can not have more than 16 apps in a folder. So say you have four pages of apps, and just downloaded a new game, and wanted to place it in a folder on your first page of apps. (I think this is a rather reasonable scenario). You would navigate to the fourth page and grab the app, then move it to the third page. This would bump an app off of the third page and on to the fourth page. You would then drag your new game from the third page to the second page (bumping one of the second page apps to the third page), then you would drag your game to the first page (bumping the final first page app to the second page). You could then finally place the new game into the folder. If you then wanted to get back your icon that was bumped off of your first screen you would drag it over from the second screen, see that it was in the upper left corner (instead of the lower right corner where you had it a minute ago), dragging it to the lower right won’t work, so you would have to move it the second last icon, and then move the last icon over one place. (Repeat per page if you want to restore your previous pages to their starting look). I will admit that personally I am not too likely to want to place one folder inside another, but I see no reason why that shouldn’t be an option. Not everyone wants their apps in such a flat organizational layout. Some people would prefer to save their apps in a more strict hierarchy. Having a limit of 16 apps per folder makes them almost useless for organizational purposes. Of the four folders on my BlackBerry Bold, three of them have over 30 applications. (And despite its smaller screen, my Bold can display more than 16 icons at a time). I have to wonder if the gesture for exiting folders has had any usability testing at all. For power users, it is kindof neat, but if I were to hand a BlackBerry 10 phone to a complete stranger, I would guess that they would be unable to exit the folder. For those who don’t know how to exit folders on BB10, just know that swiping left, right, up, or down will not work, neither will tapping anywhere on the screen. If RIM doesn’t want to go with the corner x, that the PlayBook uses, I would suggest that the huge label on the bottom of the folder that looks like a button, should do something. Why does the homescreen not work in landscape orientation? Is there any reason for this at all? For all of its faults even OS 4.7.0.65 had no problem displaying the homescreen in landscape orientation. Remember how most of the pre-installed PlayBook apps only supported a single orientation, and we had to wait a year and a half for version 2.1 in order to mostly get that fixed? Lets not repeat that mistake. The bezel swipe to unlock on the PlayBook is awesome. On the Dev Alpha, not so much. Unlike the ease of the PlayBook, BlackBerry 10 requires you to swipe twice, and furthermore the second swipe has to be in a predefined direction. It is the very nemesis of productivity, and I would much rather have access to my phone after a single swipe. Also the button on the top of the phone that look like the unlock button on the older BlackBerrys, instead does nothing useful. The 16 app per page limit is very annoying and was the root cause of most of the issues in my example in the beginning of this rant. The PlayBook already has a great system for handling this, just scroll down a bit on the page to see the rest that is there. I would be pretty happy to see that interface copied verbatim. The current implementation is very broken. 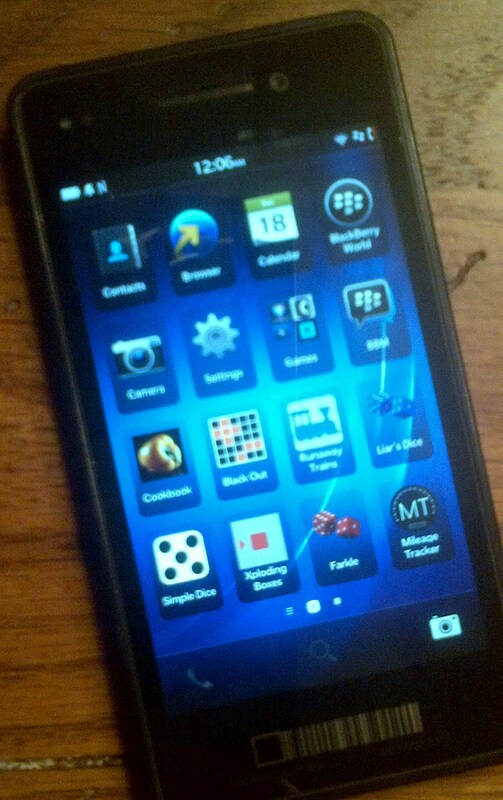 For my friends at RIM, the good news is that you still have 43 days to fix this. I don’t want to see BlackBerry 10 ship with an interface that is so frustratingly unusable.